I've always been inspired by vintage beach photos and resort towns. Possibly because I grew up in a small beachside town that swelled in population in the summer. Victorian houses dotted the cliffs and there was always a photo here and there of ladies in fine dresses and parasols walking along the beach. My town in Maine doesn't compare to the stylish French beachside resort of Deauville in Normandy. Let's have a look at my latest inspiration. Seaside resorts became popular in the 1800's. Especially in the later half of the century when developers started to build up coastal areas to attract the wealthy and upper classes. With that brought high fashion and it became popular to stroll the boardwalk in your finest outfit. Deauville, France was no exception. Developers drained the marshland and built fancy resorts. Only a little over an hour away from Paris meant it quickly caught on as a destination and was dubbed the "Parisian Riviera". Throughout the Bello Epoque era up until WWI the fashion set arrived. A young Coco Chanel (pictured above) opened her first shop in Deauville where she sold hats and soon garments that eschewed the corseted dress of the time. Deauville is in the north of France and can be chilly. Ahead of her time and inspired by the jerseys she wore due to the colder temperatures she developed a uniform of wide leg trousers and classic men's jersey tops. She was such a trendsetter that jersey would soon make her millions. However, when the first World War started the resort town shut down and the large hotels became hospices for the soldiers. 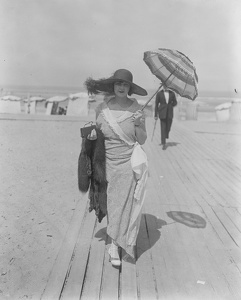 The 1920's brought back prosperity to the area and Parisians started to enjoy the beach again. Fashion photography started to become, well, fashionable. All of sudden it was the place to be seen looking like a silent film star on the beach. The boardwalk soon became a catwalk. Ladies showed off the latest in swimwear fashions. And let's not forget the races! Deauville had a race track which was the best place to show off your finery! By the 1930's all of fashion's finest were in Deauville; Hermes, Schiaparelli, but Coco Chanel remained Queen. Her mainstay fashion of wide leg trousers and jersey tops that she wore when she opened her shop were now on all of the fashion set. Coco always looked so happy in the photos of her from this time. Easy to see why! Once again though, when WWII happened, the resort town shut down and the history of the beaches of Normandy have a different story to tell. It's not until the 1950's and 1960's that the resort town gets it's mojo back. The boardwalk once again becomes a destination for fashion and remains so to this day. Have you been to Deauville? Are you like me and adore vintage beach photos and fashions? Leave a comment below. Afraid to miss out on future posts? Sign up for our monthly newsletter or follow on bloglovin'. Sandee. Vintage 1950's Plaid Cotton Bra / Bikini Top. 36A.